Value's historical advantage over growth is well known, of course. But a just-released study found this so-called value premium is especially strong in the first 100 days of a new president's term in office. In fact, the researchers found, it is more than 10 times stronger in that 100-day period than it is on average the rest of the time. And since we won't be in another first 100 days of a new president's term until at least January 2021, and possibly not until January 2025, you don’t have any time to lose: The first 100 days of President Donald Trump's term ends on 30th April. This new study was conducted by Kam Fong Chan, a senior lecturer in finance at the University of Queensland in Australia, and Steve Gray, a professor of finance at that same institution. 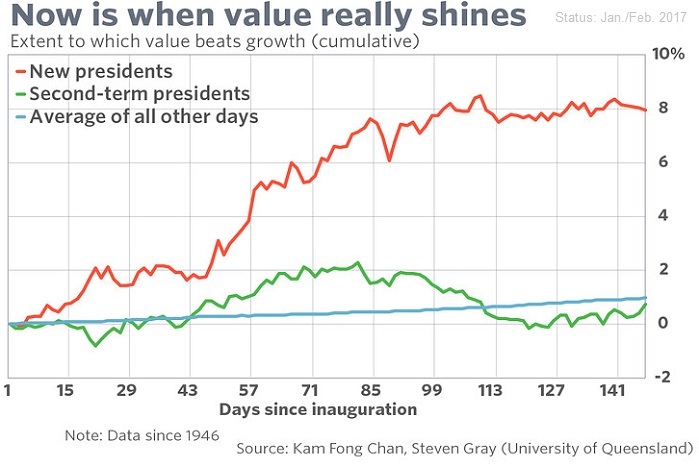 Upon analyzing the value premium in the U.S. since 1946, the researchers found it averaged 8.0% annualized during the first 100 days of a new president’s term, in contrast to just 0.55% the rest of the time. Question: Why would the value premium be so strong right as a new president takes office? Answer: The researchers theorize that it traces to the "pronounced political uncertainty" that exists during a new president’s first 100 days in office. That's when no one knows whether the new president will "uphold or renege on [his] earlier campaign promises," as Chan put it in an email, or whether the policies that get adopted will have the intended effect. This uncertainty disproportionately affects value stocks, the researchers continue theorizing, since it is harder for them "to quickly and effectively adjust their operations according to the changing landscape of the political environment." As a result, investors require a greater return on value stocks to compensate them for the greater risk and uncertainty. As evidence for their theory, the researchers point to the much smaller value premium during the first 100 days of a president's second term. There is far less uncertainty then than at the start of a new president's term, and - sure enough - during such periods the value premium has averaged just 1.2% annualized - versus 8.0% during the first 100 days of a new president’s term. Note carefully, however, that the value premium has yet to kick in this time around. Though the iShares S&P 500 Value ETF "IVE" itself, since 20th Jan. 2017, has lagged the iShares S&P 500 Growth ETF "IVW". But that isn't necessarily inconsistent with the historical record. On average, as you can see from the chart given above, the value premium at the start of past new presidents’ terms hasn't really begun to kick in until around the 50th day of the new term - early March 2016, in other words. With that thought in mind, these are the stocks with the largest portfolio weight in the S&P 500 value index, in descending order of their portfolio weight: Exxon Mobil, Berkshire Hathaway, J.P. Morgan Chase, AT&T, Wells Fargo, Bank of America, Chevron, Citigroup, Cisco Systems and General Electric GE. Disclaimer: Ralph Gollner hereby discloses that he directly owns some of the securities mentioned above (as per 17th Feb. 2016): AT&T, Cisco Systems.